A home pregnancy test is a self-diagnostic tool that allows women to quickly and easily determine if they are pregnant. These tests measure Human chorionic gonadotrophin (hCG), a hormone that is secreted in urine during pregnancy. Human chorionic gonadotrophin is measured using a technique known as an immunoassay, which involves a complex reaction between the hormone and various protein antibodies. When urine, containing hCG, is applied to the test strip, a reaction occurs which causes a portion of the stick to change color thus signaling the hormone is present and that the woman is pregnant. The presence of hCG in urine has long been a factor used by doctors to determine pregnancy. During normal gestation, hCG level doubles approximately every two days and it can be detected in urine as early as seven days following conception. Originally, hCG measurement was a complicated test which had to be administered by a doctor. The test involved taking a urine sample from the woman and injecting it into a frog or rabbit; the animal was subsequently dissected and examined. If the woman was pregnant, interactions between hCG in her urine and the animal's reproductive system could be observed. The cliche "the rabbit died" is actually a reference to this type of biological assay. Such testing has been replaced by immunoassay testing techniques, which are more sensitive and easier to administer. An immunoassay is a type of test that measures protein molecules, which interact with the pregnancy hormone in blood or urine. Early immunoassays were done with blood because this type of test is the most sensitive and can detect minute quantities of hCG. A positive test can be obtained within days of conception and before a missed period. However, tests done with blood still require the involvement of a doctor or nurse. Further improvements in immunoassay techniques led to the development of a urine-based test, which is simple and fool-proof enough for virtually anyone to self-administer at home. In home test kits, a protein called a monoclonal antibody (MAb) reacts with any hCG present in the urine. This reaction causes a color change if the level of hCG is consistent with known pregnancy levels. This kind of test can be positive two weeks after conception or several days after a missed menstrual period. To administer the test, a woman applies urine to a latex-coated test strip, which has been treated with different antibodies. The anti-bodies are placed in three distinct zones or bands along the test strip. The first band contains two types of antibodies: "anti-a" hCG antibody, which will combine with any hCG in the urine, and Immunoglobin G (or IgG), which is a control to determine that the test strip is working properly. When the urine flows past this first antibody band, two things happen. The hCG in the urine reacts with the "anti-a" hCG antibody and forms a complex. At the same time the urine suspends the IgG and carries both the IgG and the urinef'anti-a" antibody complex along the strip to the second antibody band. The second band contains anti-b hCG antibody which reacts further with the hCG to create a chemical "sandwich" which turns a bright color. As a result, a colored line appears in the test window of the strip. If hCG is absent, no binding takes place and no colored line is formed. In either case, the IgG from the first antibody band continues to move along the test strip until it contacts the third antibody band. This band contains an antibody, which will react with the IgG, forming another colored line under the control window. If two colored lines appear (one in the test window and one in the control), the result is positive and the user is pregnant. If only one line appears (in the control window), the result is negative. If no line appears in the control window, the test was not conducted proerly and should be repeated with a fresh test strip. By the mid-1990s, this immunoassay technique had been commercialized in over two dozen retail products. According to the October 1994 issue of Pharmacy Times, the home pregnancy test market had grown to nearly $200 million in sales per year. Major brands include EPT, Advance, ClearBlue Easy, and Answer Plus. The test kits on the market differ primarily by the way the user must collect and process the urine. One type of kit requires the user to urinate directly onto an absorbent area of the test kit by holding onto one end of the stick and urinating on the other. The urine is absorbed by the pad on the end of the test stick and travels along the test strip by capillary action. This design is used in products like Advance, Confirm, Clear Blue Easy, Answer, and EPT. The other type of test requires the woman to collect urine in a separate vessel. She then utilizes a dropper to deliver a precise amount of urine into a well on the test unit. Products using this design include Fact Plus, Precise, and Be Sure. Some brands, like Q Test and Answer Plus, require the woman to mix the urine with other test components before adding it to the test strip. The immunoassay strip is formed by compressing nonwoven fibers into a narrow strip and coating them with reactive antibodies. The antibodies combine with the pregnancy hormone in a series of steps, ultimately resulting in a color change. The direct application type of test contains an absorbent pad that extends from the test chamber and is used to contact the urine stream. The pad absorbs the liquid and draws it into contact with the immunoassay strip. The test strip and absorbent pad are contained within a two piece housing that allows the unit to be handheld and protects the strip from environmental contaminants. A leak-proof, clear plastic window on the side of the housing prevents urine from accidentally splashing on the test strip and allows the test and control zone portions of the strip to be viewed. A plastic collection cup is included with test kits that require collection of urine in a separate step. They may also include plastic vials with pre-measured amounts of reagents that must be mixed with the urine before application to the test strip. 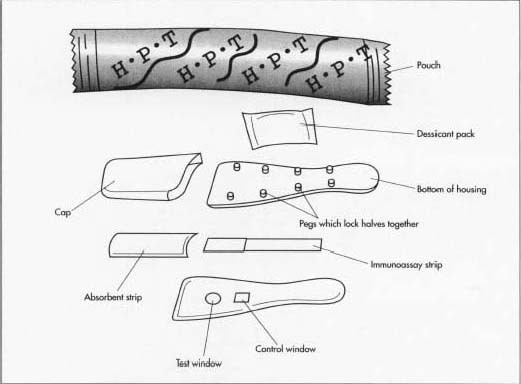 1 The immunoassay strips used in home pregnancy tests are manufactured by pharmaceutical supply firms. They are formed by compressing nonwoven fibers into a narrow strip and coating them with reactive antibodies. These strips are made from fibers such as rayon polyester blends, which can be mechanically or thermally formed into pads. This type of nonwoven fabric pad is similar to that used in disposable diapers and other applications which require highly absorbent material. The non-woven pad first may be coated with latex then treated with the liquid assay agents. As many as four different antibodies may be coated onto the strip in three different zones. A home pregnancy test is comprised of two basic components: the immunoassay strip/pad and the housing. The immunoassay strip is coated with a protein called a monoclonal antibody (MAb), which will react with any hCG present in the urine. This reaction causes a color change if the level of hCG is consistent with known pregnancy levels. After drying, the pads may be cut into appropriately sized strips for the test kit. 2 The housing used to contain the test kit is made by injection molding. In this process, plastics, colorants, resin modifiers, and plasticizers are mixed together, heated, and injected into a mold under pressure. After cooling, the mold is opened and two halves of the plastic housing are ejected. One side is molded with a series of pins, which fit into corresponding holes on the other half to lock the pieces together. The housing is also designed with contours to hold the immunoassay strip and the absorbent pad in place. In a separate molding operation a clear plastic window is created. This window prevents urine from accidentally splashing on the test strip and allows the user to view the test and control areas of the test strip. A plastic cap, which covers the absorbent pad, is made in another separate molding operation. 3 The individual pieces are transferred to an assembly line where the immunoassay strips are first inserted into the housing along with the absorbent pad. The clear plastic window is affixed with adhesive to the upper half and the two portions are snap-fitted together. Finally, the cap is locked into place. 4 The assembled test kit is packed in a foil/plastic laminate pouch along with a small sachet containing a silica gel desiccant. The desiccant absorbs excess moisture in the package and helps prolong the shelf life of the test kit. The pouch is then crimped tightly shut to minimize exposure to air. The filled pouch and a detailed instruction booklet are inserted in a cardboard box. One or two complete test kits are packed per box depending on the price and manufacturer. The filled box proceeds down the assembly line where an online ink jet printer is used to encode each box with critical information, such as the date the product was made, the expiration date, and the lot number. The box travels further down the assembly line where it is shrink wrapped for added protection. The finished box is then packed in a case for shipping. All pregnancy tests are designed with a built in quality control check—they have a control area that is designed to show if the test is working properly. This window will reveal a colored line if the test is functioning. During the manufacturing process, a random number of test kits may be activated to determine if they are operating acceptably. To limit the potential for false or misleading reading the reaction pack is wrapped in a foil wrapper. It should not be removed from the wrapper for more than five minutes before the test is conducted, or a false result may be obtained. After the test is complete, the colored line of a pregnant test result will last at least 24 hours. Interesting to note that a positive result will not change several days after the test is completed. However, some reddish background might be noticed several hours after the test is performed. A negative result should not be read in the test window more than five minutes after the test is performed. After 30 minutes, some negative tests might appear to be weakly positive. Advances in biotechnology have created the modern home pregnancy test. Further breakthroughs in immunology and related fields may result in tests which are more sensitive and which can detect pregnancy even quicker after conception. Improvements in biotechnology processes are also likely to lead to tests which are easier to manufacture and therefore less expensive. For example, improvements in the manufacturing processes of the antibodies used in these tests could result in lower prices for home pregnancy tests. "Biopolymers in Immunoassay." Kirk Othmer Encyclopedia of Chemical Technology, p. 197. Lewis, Ricki. "Replacing Test Animals, Improving Diagnoses." FDA Consumer (January/February 1993): 15-18. What makes the pregnancy test kits for blood differ from pregnancy test kits for urine? Do they have the same components, and what makes the difference of their results is that it is more sensitive in blood.